We are always looking for highly motivated students to join our lab at the Ph.D. level. If you have a M.S. degree (or equivalent research experience) and if you are already fluent in GIS, computer programming, and MATLAB, please contact Diego for details. The earlier you contact us (e.g., 6 mo or 1 yr in advance), the better, as it will give us a chance to seek funding together. Send along your CV and a two-page research statement. Read this excellent graduate school survival guide written years ago by a former graduate student at UNC-Chapel Hill. 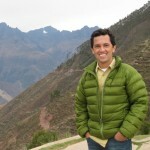 Diego Riveros-Iregui is an Assistant Professor in the Department of Geography at Carolina. He is interested in watershed science, forest and soil processes, ecosystem ecology, and landscape biophysical responses to environmental change. He teaches undergraduate and graduate courses on the biophysical responses of the environment to hydrology and human-induced change. B.S., M.S., (2012), University of Florida. Kriddie Whitmore, B.S. Biology (2011), B.A. Geology (2011), Guilford College. Sarah Schmitt (Ph.D. 2018, Geography). now Senior Scientist, Applied Research Associates, Washington, D.C.